Superb Snack Photo by Samuel E. Warren Jr.
W.L. Foods’ Yaahoo Mocha Sandwich snack is one of those snacks that you can’t eat just one. My wife, Christy Warren, brought a small bag of the snacks home after work. Christy owns and operates the CSW Cafe at 128 Independencia Avenue in Tacloban City. Christy liked the snack and thought I would. Christy is right. The Yaahoo Mocha Sandwich is one of those snacks that you can’t eat just one. It looks like a golden, crisp Ritz cracker. The taste and flavor reminds me or a graham cracker. People with dentures will probably want to have a large glass of cold milk, steaming cup of tea or a hot cup of coffee to “dunk” the snack cracker in. I did the “dunk” test. In a cup of coffee, the snack does not fall apart like a doughnut has a tendency to do. Parents with infants “teething” might want to consider this snack cracker for the infant to nibble on. I am no food critic, but I know what I like. When I sit down at the laptop to type an article, I keep one of the snacks nearby and it is great to have one of the mocha sandwich snacks handy when you are watching a movie. I put this snack in the movie snack category with Goobers, Malted Milk Balls, Twizzlers red licorice twists and boxes of Junior Mints. The international grocery wholesalers of the world should at this point be reaching for their cellphones to call the Republic of the Philippines to figure out how to get regular shipments of this snack to put on the shelves of grocery stores, supermarkets and in movie theater snack counters around the globe. Nikon D 70 Photo by Samuel E. Warren Jr. Photography Patrol–Lumpia Making In The Province–Photos by Samuel E. Warren Jr.
Lumpia Making In The Province – Photo by Samuel E. Warren Jr. Pina Gempis reaches into the shopping bag. Leneil Saldana straightens the ingredients on the spoon. Vergie Saldana takes a banana break. Analyn rolls a lumpia wrapper, while Endoy reaches for the lumpia ingredients with a spoon. Edwin Saldana watches and smiles. Lumpia is a Filipino favorite that is like a burrito or an egg roll. Christy Warren and the Saldana women all have their recopies for making lumpia, which can be a time-consuming process. However, once the lumpia is rolled, it can be placed in the ice box until it is time to cook. Lumpia is a great snack and with fried rice can make for a complete meal. 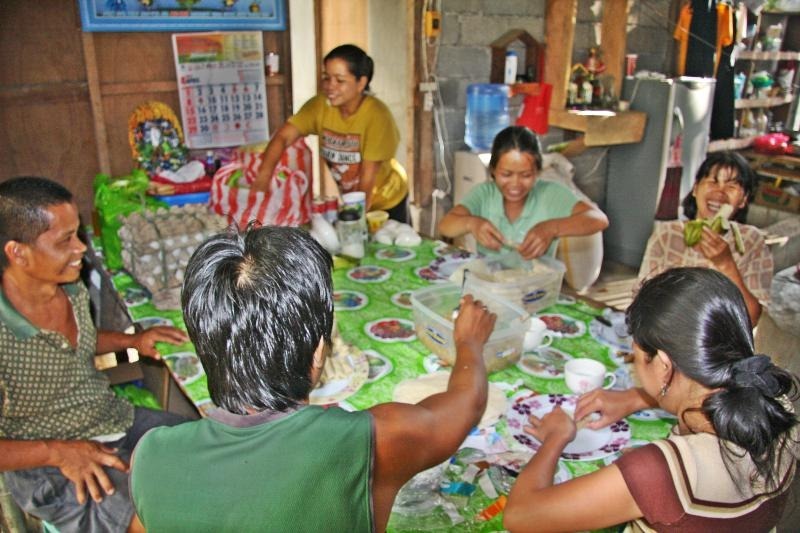 The Saldana women and their male recruits rolled the lumpia as one of the foods to be served, during this Holy Week. Photo by Samuel E. Warren Jr.
Lumpia Ready To Cook – Photo by Samuel E. Warren Jr. This plate of lumpia is ready to cook. What makes lumpia preparation time consuming is the chopping up of the ingredients like carrots, onions, bell pepper, and pork. Lumpia wrapper tend to be extremely thin, thus, the wrappers stick together quite easily and you have to have patience to carefully separate the wrappers from each other. In the States, when Christy could not find lumpia wrappers, she would use egg roll wrappers, which also work well. Once the lumpia is wrapped, it simply has to be cooked. The cooking process is more like frying, but the lumpia rolls turn out to be a crispy, delicious, golden brown. No doubt there are many places on the World Wide Web were you can find a lumpia recipe, but if you want Christy’s Lumpia Recipe, then, you will have to email me at samuelwarren55@gmail.com Photo by Samuel E. Warren Jr.